Leave your tired skin in the past and spend less time on making yourself up! Facial-Lase is a simple yet effective treatment that can make a visible difference to the way your skin looks and feels. Treat fine lines and wrinkles, acne and scars, sun damage and dull skin with Image by Laser treatments. What is Facial-Lase Laser Skin Rejuvenation? Facial-Lase is a simple yet effective treatment that can make a visible difference to the way your skin looks and feels. Facial-Lase is a non ablative laser skin rejuvenation treatment that uses a specific wavelength of laser light that targets the dermis underneath where collagen resides. By leaving the surface layer of the skin undamaged there is no downtime or recovery period. Facial-Lase treatments are known by many names including; laser facial, micro laser peel or even laser skin rejuvenation. What are the benefits of Facial-Lase? Due to the laser targeting the deeper layers of the skin there is no downtime associated with this treatment and you are able to return to your normal activities and even apply makeup afterwards if you wish. This makes this treatment ideal for busy people. The Medlite C6 Photoaccoustic laser produces high speed energy waves which stimulate the dermis or middle layer of the skin where the collagen tissue is located. The energy level used is determined based on your individual skin reaction and is adjusted each visit as needed to obtain the best results. Facial-Lase laser skin rejuvenation treatments can lead to an improvement of skin texture and tone, decreased fine lines and wrinkles and a softening of acne scars and open pores. 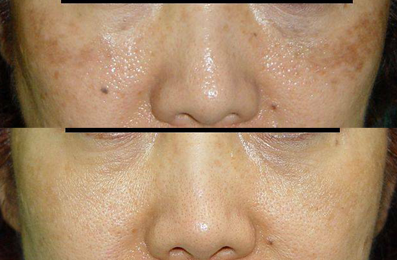 Irregular pigmentation and sun damage may also show improvement after a series of treatments. The face, neck, chest, shoulders, hands, or any area that needs improvement can be treated with this laser technology. What technology do you use for Laser Skin Rejuvenation? 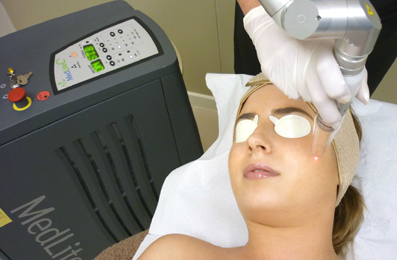 At Image by Laser we use the Medlite C6 ND:Yag 1064 nm for our Facial-Lase treatments. The Medlite C6 is known worldwide as the gold standard in laser technologies and can be used for both tattoo removal and laser skin rejuvenation applications. What does Laser Skin Rejuvenation treat?